In the current Superior Spider-Man series from Mike Hawthorne and Christos N. Gage, Otto Octavius wears a Spider-Man costume. This version of Spidey is already incredibly powerful, courtesy of the intellect and ruthlessness of Dr. Octavius, but the character got a massive upgrade in the recent issue that takes him to a volatile adventure. The majority of Superior Spider-Man #2 focuses on a fight between Otto and Terrax in the middle of San Francisco. Otto does his best to remain but he could not measure up to the might of Terrax, a herald of Galactus who wields the Power Cosmic. 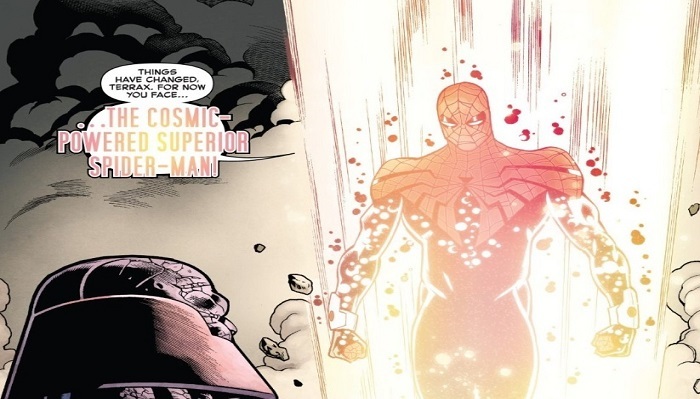 The Power Cosmic refers to a boundless source of god-like energy, channeled by Galactus. Like Silver Surfer, was given the Power Cosmic by Galactus, making him one of the most powerful beings alive. Otto had been working on a strange device in his lab for some time. When he was on his last leg against Terrax, he had his device destroyed and brought to him by his accomplices. He tossed the device around Terrax’s neck and revealed that it was similar to the device that Dr. Doom used to drain the Power Cosmic from Silver Surfer. After removing the Power Cosmic from Terrax, Otto bestowed it upon himself. The final page shows that Otto now possessed the Power Cosmic, which is bad news for the Marvel Universe. Even though Otto is battling as a hero, for now, it’s hard to believe that he will continue that good streak forever. Superior Spider-Man #2, written by Mike Hawthorne and illustrated by Christos N. Gage, is now available to buy and read online.